Link Between Worlds is nonlinear! I can't describe all the want. Oh, it's an XL. I've enough trouble playing Kid Icarus on my normal-sized 3DS. That does look sweet though. 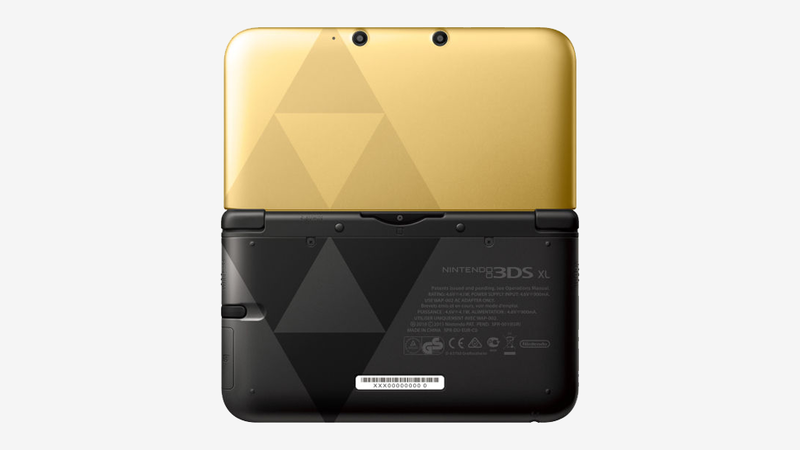 The double Triforce thing is very cleverly done. Oh yes do want. Wonder when we find out if the US gets it. I had a lot of angst regarding Nintendo last year, but 2013 has been a great for the company, and LBW is going a long way to end the year on a strong note. I just found out the villain's name is Yuga, which is a concept in Hindu philosophy and also A Guy spelt backwards. Sorry this was the best I could do enlarging and sharpening the photo. Any ideas about these characters? Cursed creatures like in LttP's Dark World? Villains plotting something? Or is that possibly Link surrounded by three allies? Is that a gold 3DS XL? For the US? It sure is. I preordered mine last week. So this game is getting a large number of high-number reviews. But the words they say...this has a chance of becoming my favorite Zelda. The hardest part will be not setting my expectations too high. I'm still wary of the 2D drawing bits. That's enough to keep my head on the ground.